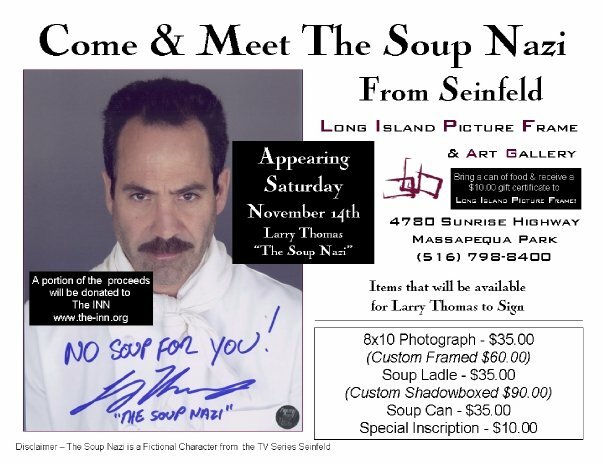 On Saturday November 14th 2009 Seinfeld's Larry Thomas aka The Soup Nazi Came to Long Island Picture Frame & Art Gallery in Massapequa Park to sign autographs. Larry greeted customers and talked about the Seinfeld episode that became one of the greatest episodes that series had. Seinfeld fans were excited to walk in and beat Larry to the famous line "No Soup for You"!